The Discmania Deep in the Game US Tour takes us to Denver, Colorado as we continue on our travels back to the West Coast after 11-weeks on the road. It’s been one of the best Disc Golf Tours that I’ve ever been on and probably the hectic traveling scheduling that I’ve taken part in so far with 10,000+ miles down and a few more to go. Trust me I have traveled a lot for Disc Golf throughout the years and this one has us on the move everyday as we don’t spend more than a couple of days in one location. So far our travels have taken us from the West Coast all the way throughout the South to the East Coast, then back through the Midwest straight across the Great Plains States to the Rocky Mountains of Colorado. All in all, that’s 19 states down and I made sure that Simon played at least one course in every state that we have visited thus far except for the quick cross overs in both Mississippi and Indiana, but he’ll get a chance to play in those states again in the future. We have completed 16 of the 18 scheduled Deep in the Game Disc Golf Instructional Clinics so far with only the last two remaining in Santa Cruz and San Francisco on the last leg of our Spring Tour before heading back to home base in Rancho Cucamonga. I’m really looking forward to the California Clinics as it’s been a few years since I’ve done a clinic in either of those locations and I anticipate both of those events to be full in the next week or so. You can sign in here. So far it’s been a very cold and rainy Spring Tour with lots nasty weather conditions to deal with along the way. That’s one reason why we chose to travel throughout the South during the early part of the season was because of the possible warmer weather and better playing conditions plus many of the bigger events have been throughout the Southern States. The toughest weather that we had to deal with so far was the extreme winds driving through Kansas on our way to Colorado. 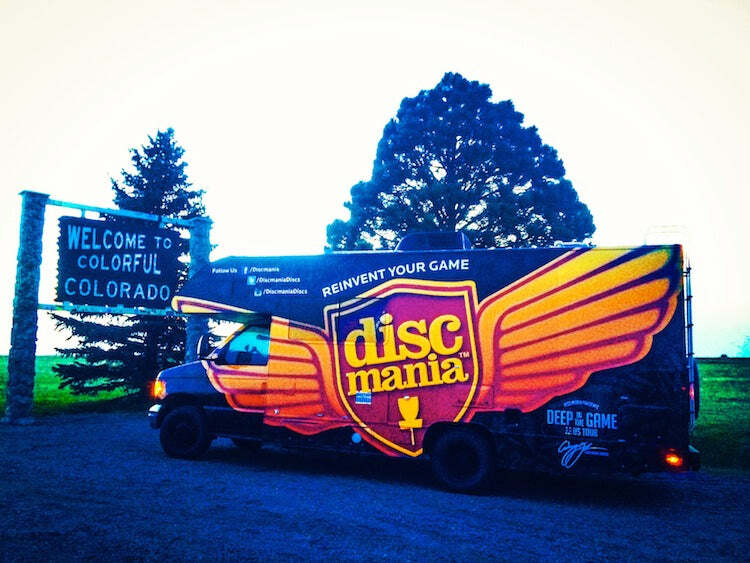 It was very difficult to keep the Discmania “Maniac” Motorhome on the road during that long 8-hour drive! For those players and Disc Golf promoters that have been constantly requesting to have us travel throughout the North, we haven’t been purposely avoiding you, it’s all based on the current PDGA Tournament Schedule and the potential weather conditions. So don’t you worry as we’re currently planning out the Summer/Fall US Tour at the moment! Please contact me at: Avery.Jenkins@Discmania.net if you want to request a Discmania - Deep in the Game Disc Golf Instructional Clinic in your local Disc Golf Community. On the Tournament Scene, Simon has been on a tear lately winning his first US Tournament at the Eagle Eye Open in Georgia two weeks ago and then winning his very first Supertour event at the Glass Blown Open in Kansas against some very solid competition. He is starting to figure out his game and heating up at the perfect time going into some bigger tournaments coming up. We are currently making our way to California and getting there just in time to prepare for the upcoming Masters Cup PDGA National Tour Event as I have a feeling that he will really enjoy his time at the DeLaveaga Disc Golf Course in Santa Cruz. 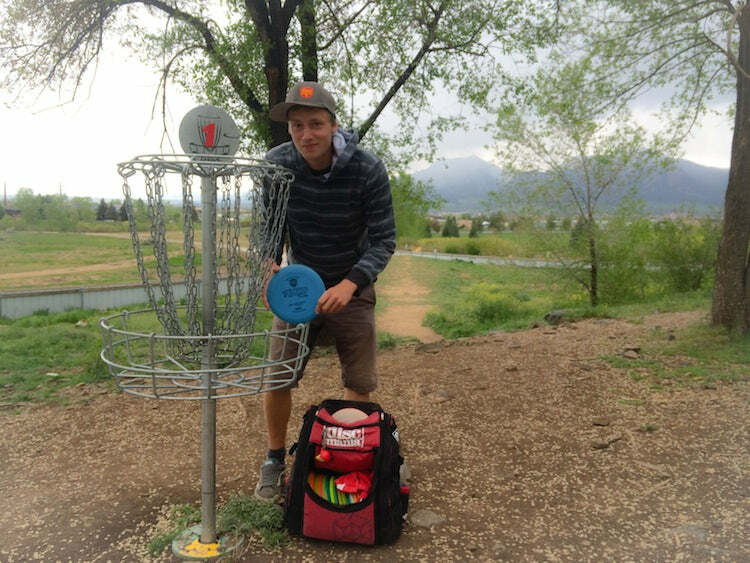 Simon's 1st throw in Colorado - 1st Ace!